Treon's Realm: Ni No Kuni Rant! It turns out that the PS3 version just received a "Wizard's Edition" for those who pre-ordered and among the cool bonus items was the Wizard's Book! The very same book Namco used as their excuse for not bringing us the DS version of the game! This is irritating beyond words for fans who really wanted to play the game for the system it was originally created for. What is even more baffling is when you consider the sales numbers of both editions in its homeland. That's a pretty large gap in sales and the North American RPG market on PS3 isn't nearly as large as the Nintendo DS one. While some may argue that the DS version wouldn't sell by the time of an English release, that argument is void on two points. The Nintendo DS is the biggest selling video game console of all time and RPG's such as the 2012 Pokemon Black and White 2 still managed very impressive sales on the 8 year old system. 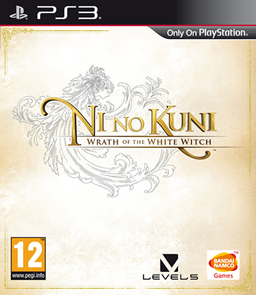 While you could claim that the Nintendo DS is at the end of its life, the same argument could be made with the PS3 which has less than half the install base of the DS and this issue looses all validity when you consider the Nintendo 3DS is fully backwards compatible with the game and the 3DS would do well with more quality RPG's such as this. "A new RPG from the Developer that brought you Dragon Quest IX and the Professor Layton series!" What's really odd is that Namco is bringing over Project X Zone for the 3DS this summer which sold far fewer copies than Ni No Kuni!? Bare in mind that I am not complaining about Project X Zone coming over (I'm not), I am simply drawing a comparison about how odd the situation is. I'll end this by questioning why the game hasn't been announced for the Nintendo Wii U? All of the work is in porting the game over since the translation is already done and the game would feature the best of both previous versions. The HD graphics of the PS3 with the touch control of the Nintendo DS and you could even incorporate the Wizard's Book on the touch screen and it would feel completely natural. Again I am thrilled the game made it over here, just saddened that the original version did not. The thing that really pisses me off is that if the game doesn't do well on PS3 (which some fans feel is possible), companies will point to that as a reason for not bringing over other JRPG's that could do well. Please comment below on your thoughts about this awesome RPG. Enjoy the Japanese Nintendo DS trailer for this amazing game.